In contrast to Doc Brown’s Technic Ford Tudor, which we featured yesterday, comes 1saac W.’s tiny Model A hot rod, also from 1932. You can see more of Issac’s cars, including his Dodge Polara Police car which we featured recently, on his Flickr photostream. In the meantime some of the Elves have been looking a bit malnourished recently. The doctors suggested more oranges in their diet, so here’s the result. 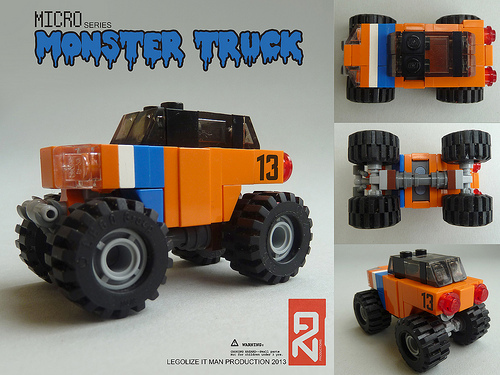 This mini monster truck is the work of LEGOLIZE IT MAN, on Flickr, who’s better known for his stylish spacecraft, with accompanying concept artwork. 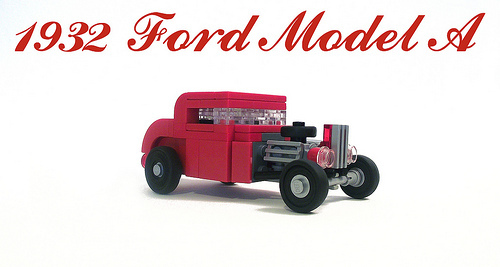 As well as a colour scheme and graphics similar to some of his spaceships, this little car features multiple stud angles and a pair of lightsabers as axles, attached to a chunky propshaft. See more at the link.